We've had furtive glances of Sony's upcoming NEX-6 before, but only in the very clinical space of a government test lab. 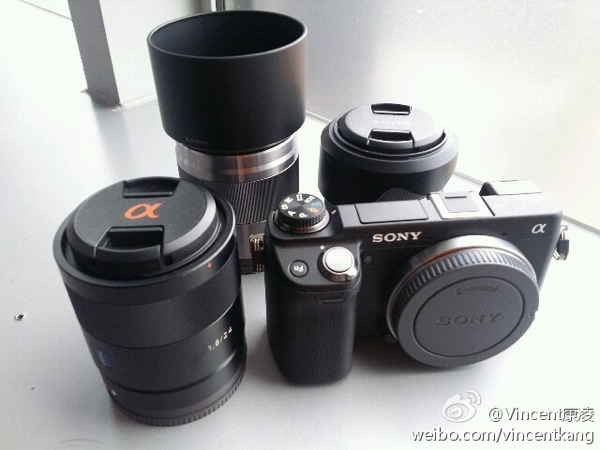 Apparently, no mere agency can confine it: photography workshop director Vincent Kang has posted a photo of the pre-release mirrorless camera on Weibo for all to see. Posing next to 24mm and 50mm lenses, the NEX-6 looks to be very much the in-between camera we suspected it was, without as much dedicated control as the NEX-7 but still carrying an electronic viewfinder, a pop-up flash and a dedicated function key near the shutter release. The dedicated mode dial is also more conspicuous -- there's no question that Sony wants to free up controls on the back for the future camera's more experienced target audience. Between the new design and the already known inclusion of WiFi, it's looking as though the NEX-6 may hit the sweet spot for shooters who want more control than the NEX-5R without sacrificing all its newer features. We just need to wait for official launch details to make it all real.